(It does not matter if the dates and information which follow are not 100% accurate; what matters is the whole magnificent truth of the creation and ongoing evolution of our universe as a single Divine entity. Since the beginnings of human awareness we have been driven to understand our origins: the great mystery. That which created us. We have sought answers to the most profound questions. Who are we? Where did we come from? Where are we going? And what are we to do? Drawn to that which lies beyond our understanding, we have looked upward into the heavens, inward into the smallest particles, and deep into our own hearts, minds, and souls to find the answers to these questions. It is a story of beauty and deep mystery, the story of the universe, the story of the Earth, the story of the human, the story of you and me. It is a narrative of one single integrated activity, the unfolding of the universe. In the beginning was the Mystery, the churning quantum potentiality.Through the mystery all things came to be. 13.7 billion years ago, from that place that was no place, from that time before time, the Cosmos flared forth in a silent blaze of inconceivable brilliance. All the energy that would ever exist in the entire course of time erupted from a point smaller than a grain of sand. The universe as we know it did not exist. What was before cannot be known. Ultimate mystery. Silence. Stillness. Absence of light. 300 thousand years later, from this bursting forth of tremendous energy came the first atomic beings of hydrogen and helium. And for a billion years, they scattered furiously away from each other into the great void as the universe continued to expand and cool. 12.5 billion years ago, hydrogen and helium, the primal beings, began to fashion themselves into an estimated hundred billion pinwheeling galaxies: Andromeda, the Virgo cluster, Pegasus, the Magellanic Clouds, the Hercules cluster, our own Milky Way – one hundred billion galaxies in all. These gigantic structures soared through the emptiness of space, sweeping hydrogen and helium into self-organizing systems, and clusters of systems, and clusters of clusters of systems. Each galaxy presented its unique form to the universe. Each brought forth from its own materials billions upon billions of primal stars. As these stars transformed and exploded in supernovas, spewing stellar materials throughout the galaxies, new stars were formed, richer in potential and more complex in structure. From these explosions, carbon, nitrogen, oxygen, calcium, and all the other hundred or so elements were formed. 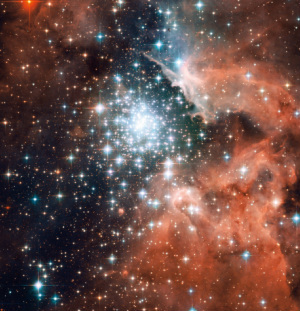 5 billion years ago, after the universe had been expanding and developing for several billions of years, our Milky Way galaxy shocked a peacefully drifting cloud of these elements into giving birth to ten thousand new stars. One of these was our Sun. Around our Sun, nine planets were formed, all with different characteristics and different conditions: Mercury, Venus, Earth, Mars, Jupiter, Saturn, Uranus, Neptune and Pluto. Over hundreds of millions of years, Earth swept up solar system debris in its orbital path, swelling in size. Collisions great and small kept Earth a churning, molten mass. But as the cataclysms of growth slowed, Earth began to cool. Soon afterwards, the rich chemical brew brought forth the wonder of life. The first cell emerged and Earth came alive. Before long, Earth learned to transform light from the Sun into food energy, inventing the process of photosynthesis. A by-product of this powerful process was oxygen, which at that time was toxic to life. Over hundreds of millions of years, the deadly gas accumulated in the atmosphere, causing great devastation in the community of life. As many as 9 out of 10 of all living beings were destroyed. In response, the Earth invented a new process as some tiny microbes learned to use the dangerous oxygen and began to breathe. Two billion years ago, some of the oxygen breathers merged symbiotically with larger cells and the second kingdom of life arose: the first cells with nuclei. All animals, plants and fungi are descended from these first nucleated cells. 1 billion years ago, life was drawn toward union and learned to reproduce itself sexually, and the great principles of masculinity and femininity were activated on Earth. 600 million years ago, crustaceans emerged in the form of snails and clams. Eyes emerged; the Earth saw herself for the first time. 510 million years ago, the first fish moved through the oceans, inventing the backbone to protect Earth’s earliest nervous system. 460 million years ago, ocean waves left algae stranded on the shore. Leaving the water to live on land, they began to experience gravity and weather and were soon followed ashore by the first land-living animals, the insects. 425 million years ago, plants developed wood cells and learned to stand upright, living along the shores of oceans and rivers, slowly transforming themselves into what we know as trees, capable of covering entire continents with life. 395 million years ago, insects, developing ever larger appendages to cool themselves by fanning away excess body heat, unexpectedly took off and became the first creatures to inhabit the sky. 370 million years ago, fish followed plants and insects onto the land, and soon the continents were animated with amphibians, and then reptiles. 235 million years ago, great dinosaurs appeared. For 170 million years, these creatures explored the extremes of size, speed and power. 215 million years ago, mammals emerged. What began as molten rock on earth had, over the course of billions of years, reorganized itself to be able to express a mother’s love for her child. 150 million years ago, birds emerged. They followed the insects into the vast vault of the sky. All manner of life flourished. 114 million years ago, the first flowers appeared on the land and transformed the Earth from green to all the colours of the rainbow. 65 million years ago, a large asteroid struck the Earth, filling the air with tons of obscuring particles and igniting enormous raging fires, which further clouded the skies. The little sunlight that reached the Earth’s surface was only one tenth of the intensity of the full moon. The dinosaurs went the way of extinction, opening many places in the ecosystem. Over the millions of years that followed, mammals began to fill these places. 20 million years ago, new mountain ranges were formed – the Sierra Nevada, the Himalayas, the Alps. 4 million years ago, our ancestors emerged from African forests and began to stand upright to walk the plains. 2 million years later, with their hands now freed, they began to create and use tools. In another half million years, they were controlling fire. At some time during these millions of years, the capacity for conscious self-awareness began to emerge within them. They became conscious of themselves and of their relationship to the world around them. 30 thousand years ago came cave painting. Modern Homo sapiens emerged in the unfolding life process. 10 thousand years ago the cultivation of plants and animals began, and eventually the rise of the great civilizations of humankind. Observing patterns of seed and seasons, domestication of grains began. Because of this new development, called agriculture, we changed our way of life and culture radically. From a roaming life as hunters and gatherers, we now settled into villages. The food supply expanded. Populations surged. Pottery, weaving and architecture were developed. Conscious of our dependence on the awesome forces of nature, rituals and celebrations honouring the cosmic rhythms and the great mother deity (earth) were performed. Language, religion, cosmology, the arts, music and dance took on vigorous forms. 3 thousand years ago, the Classical Religions began to emerge with the teachings of Moses, followed over the next millennium by the teachings of Buddha, Lao Tzu and Confucius. The Mayan civilization flourished. Still later the lives and teachings of Jesus and then Mohammed led to the rise of Christianity and Islam. Three hundred years ago, Western philosopher-naturalists began a three century plunge into the study of matter to discover the nature of the cosmos, from the movement of the planets and the age of the Earth to the innermost workings of living creatures. Some ninety years or so ago, Einstein’s equations revealed the possibility that the universe is not a static place, but rather an ongoing, developing entity, that emerged at some distant moment in ‘time’ and some day may die. 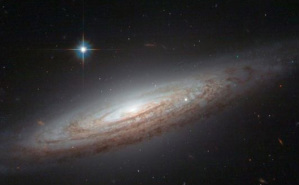 Soon after, observations of distant galaxies confirmed that the universe is indeed expanding. In 1965, scientists heard echoes of the birth of the universe through instruments sensitive enough to detect radiation from the first flaring forth, thirteen and a half billion years ago. In 1968, humans stood on the moon and witnessed the Earthrise, as earth became complex enough to witness her own integral beauty as a whole for the first time. Today we understand a meaningful story of the universe. Today we celebrate the sacredness of the whole Earth/human community. Today we enjoy the beauty of the Earth, given to us over a 13.7 billion-year span of time. "That we are part of the galaxy is literally true. We look at the galaxies with a galaxy’s eyes. To understand this is to give voice to the silent stars. Stand under the stars and say what you like to them. Praise or blame them, question them, pray to them, wish upon them. The universe will not answer. Tomorrow is still veiled in mystery….